Doug suggested a couple of test games of DBA 2.2 to get ready for Cancon 2013. 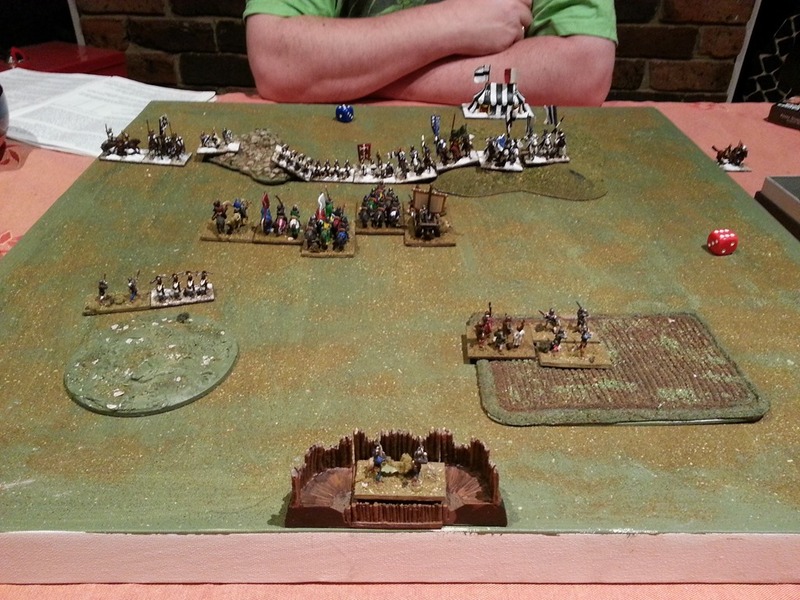 We made up a Later Hungarian Army from his Germans and he took his Teutonic Knights out for another run. 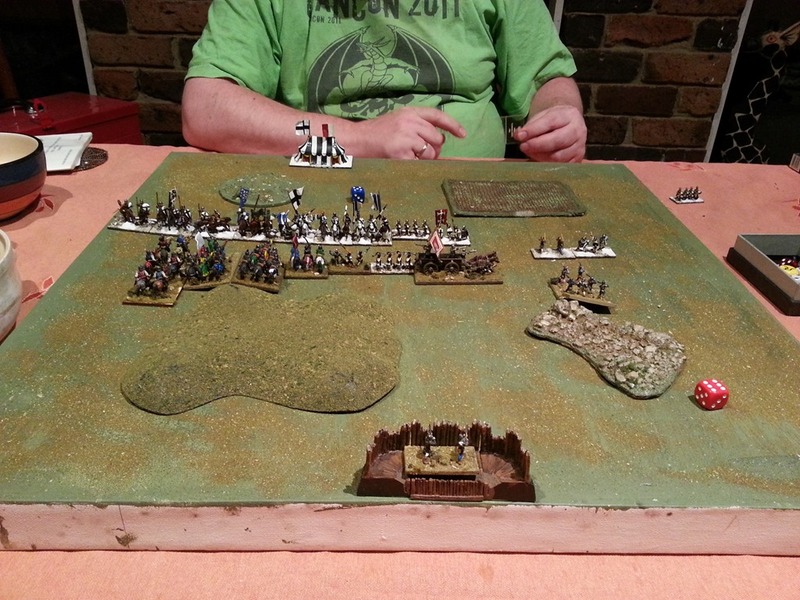 Picture above is after a couple of moves whilst I was particularly trying to get used to the war wagons. The game moved along nicely with me steadily losing elements. The end result was a victory for Doug (4-1). I did learn a couple of lessons from that game and whilst the 5Wb (the warband that have earned the role of control group in the paining) may look good, they are not really useful on the table in this time period. A second game was played. 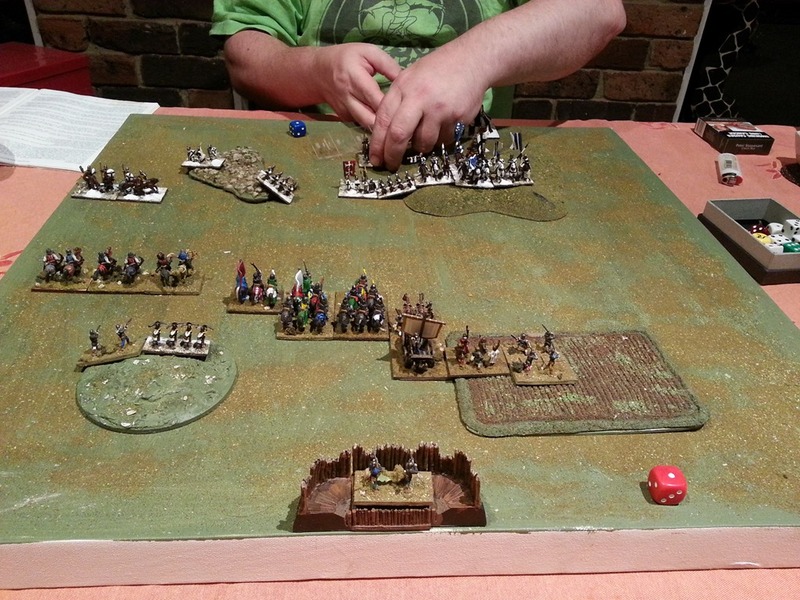 In this game I used the Hungarians a little more aggressively trying to get the feel of the war wagons. I’d also replaced the 5Wb with some blades whom earned their position by beating an element of Doug’s knights. This game went down to the wire with a 4-3 win to Doug. I was a lot happier with the feel of the Hungarians here. I guess training is over and I am ready for Cancon 2013! Good clean healthy fun. It was nice to get a couple of games in. Excellent – game looks great. I can’t get into DBA and have swung toward Impetus. I guess that is more in line with who I have to play against than the game system really. Hope to catch up at Cancon. I am really looking forward to this year as it may be my last in some time to visit Canberra.